Paul Soulellis (Assistant Professor, Graphic Design) has curated and co-published Printed Web 4 with International Center of Photography (250 Bowery, New York) on the occasion of ‘Public, Private, Secret’ organized by curator-in-residence Charlotte Cotton. The exhibition is currently on view through 8th January 2017. The 40-page print-on-demand newsprint folio presents work by Wolfgang Plöger, Lorna Mills, Molly Soda, Travess Smalley, Angela Genusa, Eva and Franco Mattes, Anouk Kruithof, Elisabeth Tonnard, and Christopher Clary, with a text by Rhizome artistic director Michael Connor. The broadsheet publication contains ten loose, folded sheets. Each participating artist worked with the two sides a single sheet, responding to the idea of privacy in relation to contemporary self-identity and public visibility. 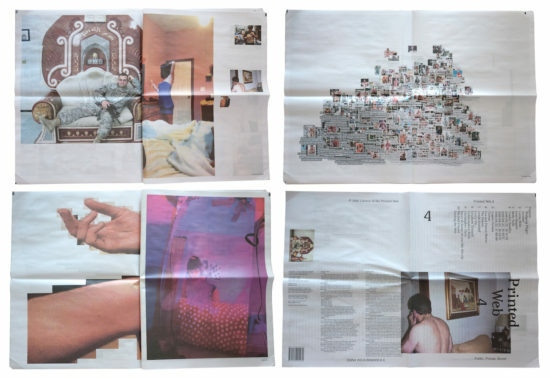 Printed Web 4 was launched at Miss Read, Berlin Art Book Fair at Akademie der Künste, Berlin (10-12 June) and was also on display at ICP Museum during its opening week (June 21–27).